Men's rugged work gloves with cowhide leather protection and reinforcement. Stacking wood or clearing brush, hard-working hands deserve the durability of cowhide leather. These men's work gloves are made of sturdy cotton duck with a cowhide leather palm, reinforced patches, and knuckle protection. 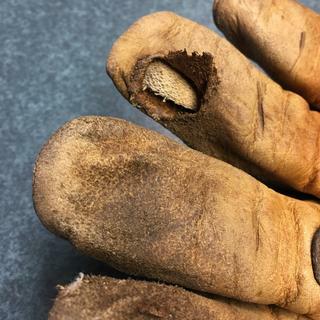 Carhartt Gloves will cover premature failure of any of our products caused by a defect in the original materials or workmanship. Carhartt Gloves has the right to replace any damaged merchandise at its option and expense. I recommend these gloves for the working Man. Most durable work glove out there! Over the years I have bought an untold number of work gloves and I was always disappointed with how they held up, until I bought these. They are by far the most durable glove I have ever used and I would recommend them to anyone! Fine product!!! My husband had a pair exactly like these, that were 3-4 years old. He loved them and was so glad you still make them. They have held up very well with all of the outdoor works he does. When these fall apart, I will buy my third pair. Replaced an earlier purchased pair. The stitching on the first pair eventually failed. But these were good gloves and I used them a lot for handling firewood running power tools. The new ones seem to run a little smaller. Started coming apart between the fingers after two months of use, expected more use out of them. My hubby has looked for the replacement of these gloves for almost a year. The local stores do not carry this particular style (too bad) So we ordered direct from Carhartt. He said he prefers these gloves above any and all others. Thanks from a very satisfied customer. This is my second pair of these gloves. Carhartt has good sizing. XXL has long fingers. Perfect gloves for lumber and tree work. Couldn't even last 1 month on the Farm. Needed some new gloves, so I picked these up at my local Tractor Supply. The fit great and were comfortable. Kept me warm in the cold, and not too heavy for winter. However, the durability of these are TERRIBLE!! After only one month on the farm, there is a large hole in one finger, and another hole starting on another finger. I expected much more from Carhartt!! Always been a name we've trusted to get the job done. This is what you get when a quality US company starts making crap in CHINA!!! Never again Carhartt. You disappoint me. We have reached out to the customer and shared this review with Quality Control. I bought these gloves as the closest product I could find to the work gloves provided by my employer (I am now retired). I had not used them long before the seam parted on the outside of the little finger of one glove. I was really disappointed in this, but continue to use the gloves since it still provides overall protection. I have actually bought a second pair since I like the gloves otherwise and intend to give them a second chance with regards to assembly quality. Gloves looked nice and fit well, but ripped within 2 hours of putting them on doing LIGHT work. Total garbage and total waste of money. I thought I was buying quality with the Carhartt name. Never again. 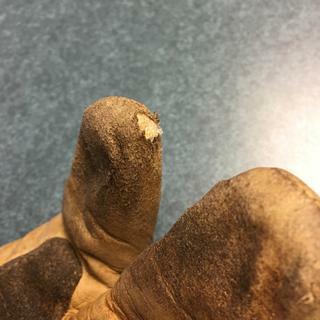 i use these gloves from everything like throwing hay, to light duty mig and tig welding. They are the best pair of gloves I have ever gotten. I am in the process of getting my second and third pair of these gloves. I have not found another glove like these with the same flexibility. Having large hands, it has always been difficult finding gloves (especially work gloves) that fit properly. I ordered two pair of these gloves in 2XL and they fit perfectly. Gloves were a very generous fit for the stated size. Material and workmanship were excellent as well. I"ve ordered these gloves more than once and the style,fit and quality is good,S&H could be better. I have a husband whos hands are very large. 2xlg is usually not big enough. What do you say about these mens gloves? BEST ANSWER: The XXL size refers more to the girth of the hand & fingers. The finger length is no longer in the XXL than it is in the XL. I was hoping more greater finger length. The XXL will accommodate big meaty hands but is not great for real long hands. It is a challenge to pull the glove past the knuckles and thumb due to not a lot of elasticity. But after that, they are comfortable fitting. I'm at 6'6" with long, skinny fingers. I have very large hands, too. Other XXL gloves are snug. These are roomy—almost loose. I'd suggest you at least try them out. They are sized generously. If they don't work, you can always return them.